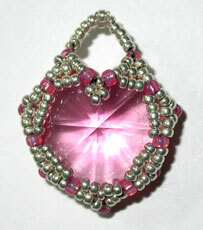 Stitch a lacy seed bead bezel for the lovely heart shape crystals from Swarovski. The open-work sides allow the light inside the crystal for maximum flash & sparkle. Completed charm is 1" long from loop top to point.